Since my last article, I can report that we have had a busy few months in the Museum. Membership numbers have increased significantly which is fantastic and has kept Sonja (our membership secretary) busy. We have also been working with the Tayside Landscape Project and a Museum Consultant to see how we can get more people into the Museum. This is absolutely critical to the future of the Museum. Visitor numbers have been down this season (not helped by all the rain) and we are determined to reverse this. To assist in this goal we have also been working on our 'forward plan' for the next 12 months in order to ensure that we maintain our high standards within the Museum and that we are properly looking after our volunteers, members and visitors alike. The social committee have also been busy working on our fundraising events. Did you know that our electric bill alone during the winter quarter was £600? From 19 to 21 October we will be holding our first Art Exhibition in the Museum. I hope that lots of you will come along and support us in this new venture. The Museum exists for the benefit of the community. If you have any suggestions or comments I am very keen to hear from you on 850578 or rachelcheer@hotmail.co.uk. And remember what we do today is future material for the Museum and will eventually become Abernethy's past! The Museum is now closed for the winter season, but as ever much work goes on behind the scenes looking after the collection and doing research. I am delighted to report that we have held a very successful first Art Exhibition in the Museum at the end of October. After a few weeks of hard work and anxiety (mostly on my part!) we held a fantastic preview evening for Museum members and exhibitors. We were then open to the public for three days. We made a healthy profit in the region of £400 and welcomed over 300 visitors. I would like to extend my grateful thanks to everyone who contributed and supported us in this new endeavour. Moving our thoughts to next season, we are planning an exhibition about World War I. 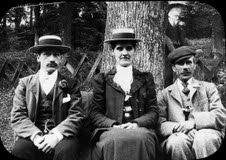 If you have any pictures, artefacts or anecdotes we would be very pleased to hear from you. Please contact the Museum on 850889 (and leave a message) or email secretary@museumofabernethy.co.uk. Alternatively, volunteers are usually in the Museum every Tuesday from 9.30 am to 12.30pm and from 2pm to 3pm. Finally, can anyone help us to identify this fascinating mystery photo? Any thoughts gratefully received!